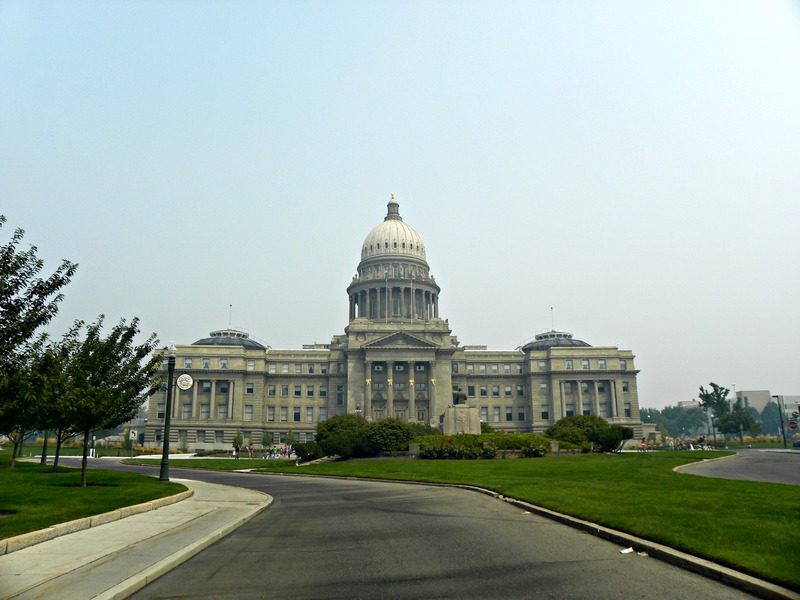 The air in Boise was thick with smoke from the Trinity Ridge Fire the day we visited the Idaho State Capitol. 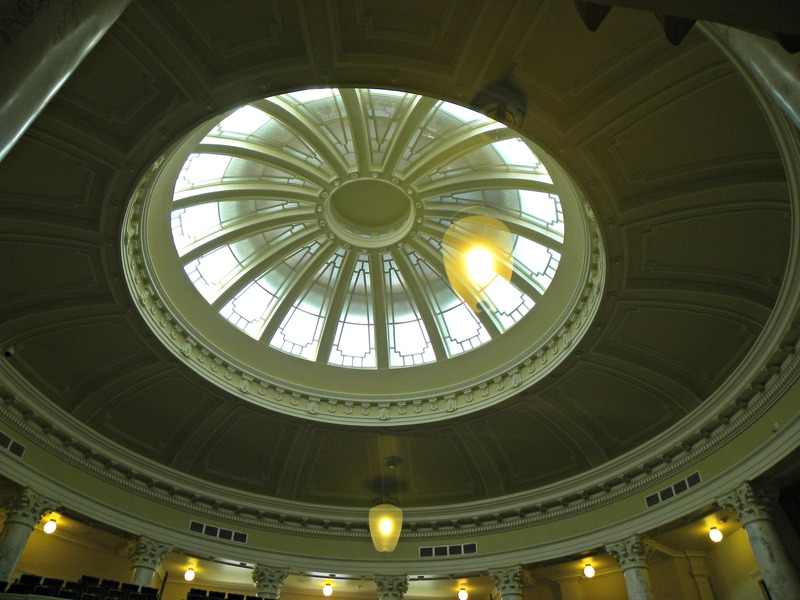 The dome of Idaho’s State Capitol rises 208 feet into the Boise skyline, a classical architectural form prominent among the city’s modern multi-story buildings and the landscape’s rolling foothills. The Renaissance Revival Capitol is Idaho’s most significant historic structure and a building that reflects the state’s political, social, and economic history. 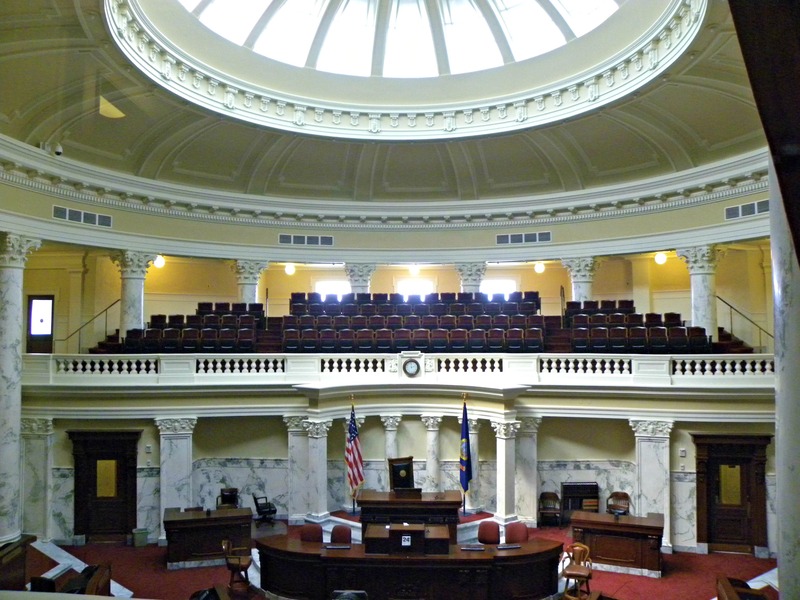 Over 100 years since conception, the Capitol continues to function as the seat of Idaho’s state government, currently housing the executive and legislative branches and numerous state offices, which occupy much of the approximately 111,600 square feet of usable space. Although the use of transitional architectural form is drawn from various historic epochs, the materials used in realizing the design draw upon local resources. Composed of locally quarried stone, the sandstone exterior resonates the dusty light auburn hues of Boise’s surrounding foothills, adapting the Capitol’s civic symbolism to serve the people and land of Idaho. 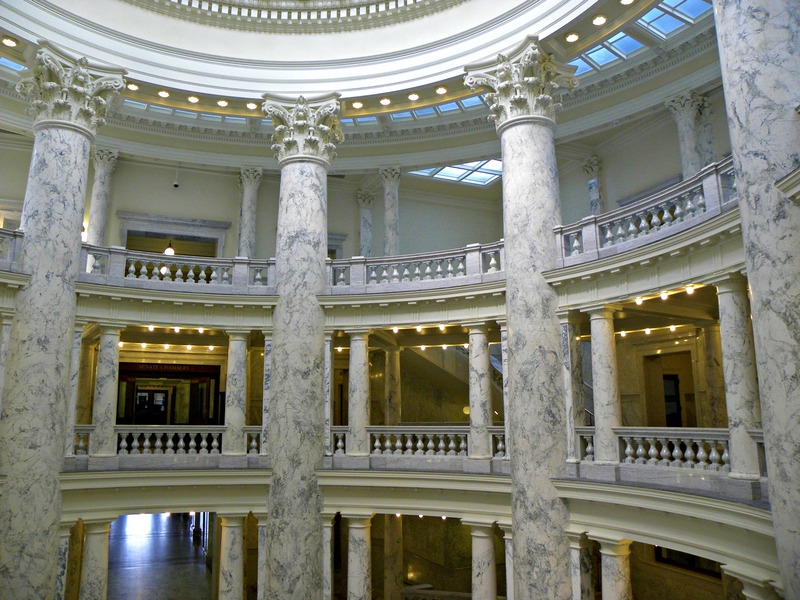 In 1905, the Idaho legislature passed the bill authorizing construction of the Capitol Building. The architects of the Capitol Building were J.E. Tourtellotte and Charles Hummel. The dome and central parts of the Capitol were built first—from 1905-1912. The wings (House and Senate chambers) were constructed during 1919 and 1920. Most of the superstructure is made of sandstone taken from Table Rock (near Boise). Convicts from the old Idaho Penitentiary were responsible for transporting the 10-ton sandstone blocks from the quarry. 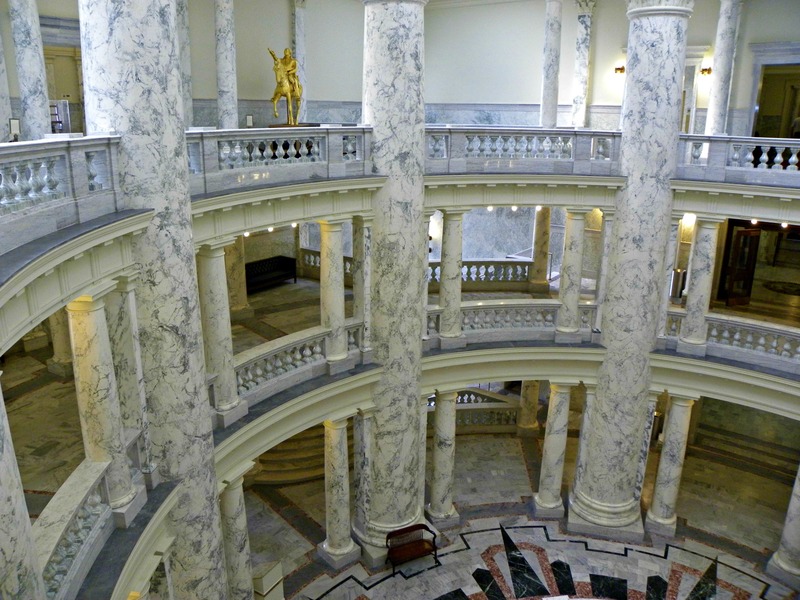 From the first floor to the eagle atop the dome, the Idaho Capitol Building rises 208 feet. The floor area of the building when completed was 201,720 square feet. 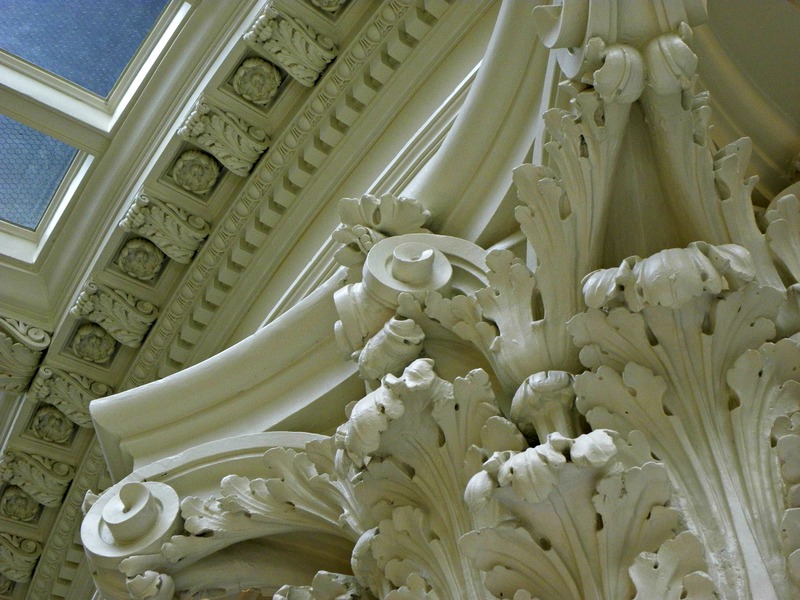 Over 50,000 square feet of artistically-carved marble exists in the building. The original cost to construct the Capitol was $2.1 million. Replacement costs today would be over $100 million with many materials considered irreplaceable. 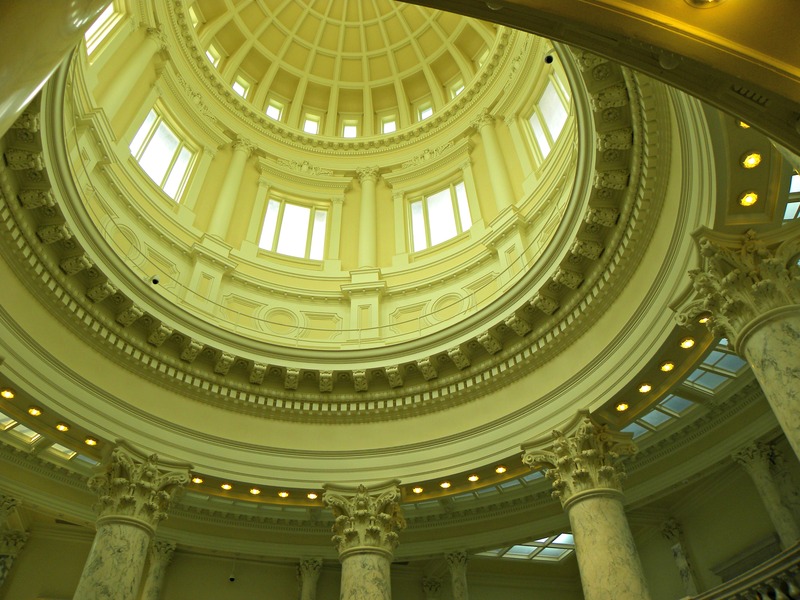 Idaho’s Capitol Building is the only one in the United States heated by geothermal water. The hot water is tapped and pumped from a source 3,000 feet underground. The eagle atop the dome stands 5 feet 7 inches and is made of copper. In 2005, as part of the exterior restoration, it received a new gilding of gold leaf. What a wonderful building, Justina! Love the architecture and the four types of marble. Great photos! Thanks for sharing. I don’t know that I would have thought of visiting the capital building. It’s cool. 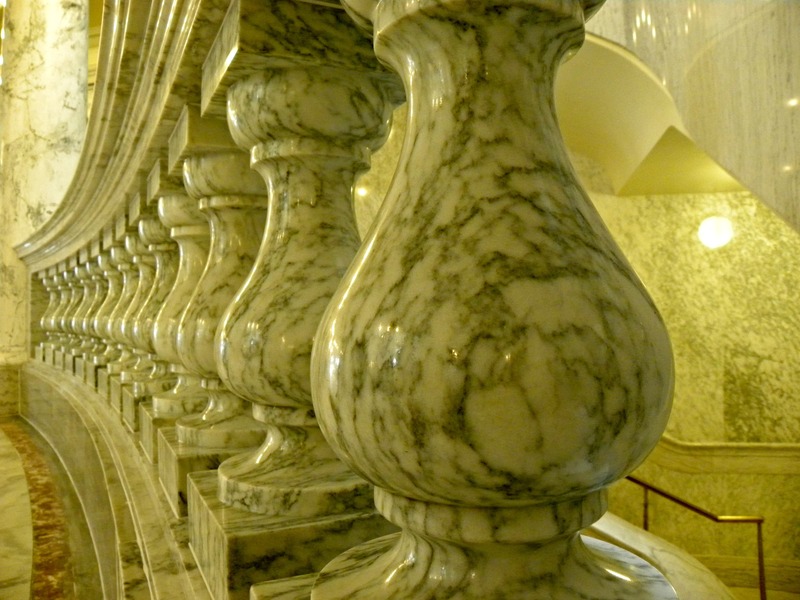 My favorite pic is the repeating shapes of the marble railing-holder-uppers. I love the point-of-view you picked.